Here we go again. The glorious comeback of the tax return. Our yearly reminder that your first financial overlords await your annual offering. This year I looked at three apps, all of which are Web-based. In addition to these Web apps you’ll find that each of these companies offer desktop versions with similar features. Truth is, the online versions of these apps are near, if not exact, mirrors of their desktop counterparts. All offer the same features, the only difference being that your data is stored on the Web rather than on your local hard drive. iOS versions, where offered, are linked to the same Web data you access using these apps. And, it’s important to note that no matter what application you use, unless you print and mail a paper return, at some point in time your data will be travelling securely across the Web, through one of these companies to the IRS’s servers. Which three online apps will we look at? All of these tax tools work really well. They make gathering and entering information easy, and, if your have all your paperwork ducks in one place, will help you knock out fairly complex tax filings in 90 minutes or less. These apps are clear about why you are or aren’t getting a refund, and they all make the filing process simple. 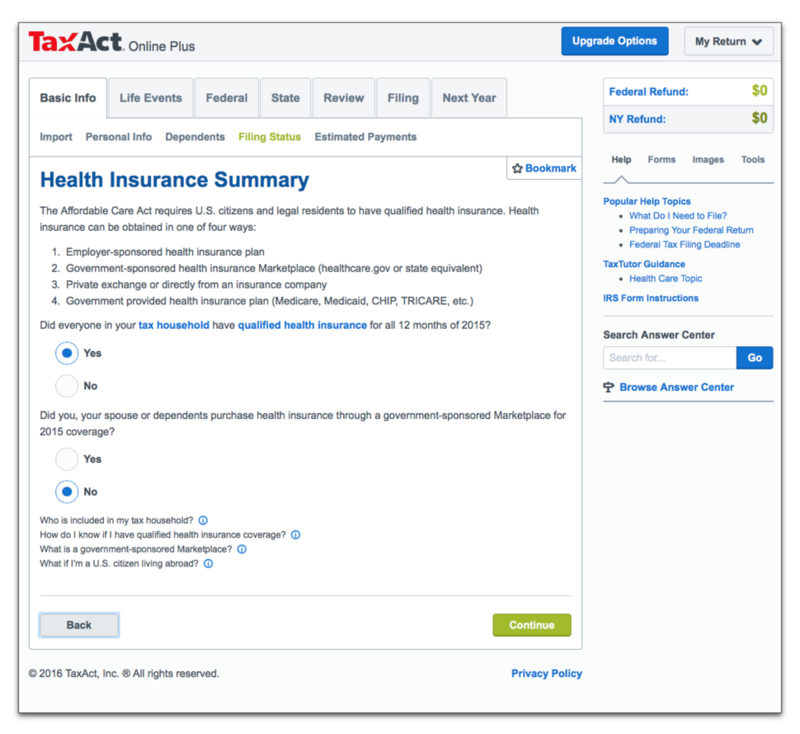 Let’s cut to the chase: TaxAct pretty well bowled me over with its simplicity, but even more with the breadth of its online offerings; from the most basic to corporate tax filings, Tax Act offers it all, leaving H&R Block and TurboTax in the dust. Once you’ve imported your prior year’s tax return, you’re asked to verify information to ensure it imported correctly. This includes checking your social security numbers and any dependent information, adjusting whether or not you or anyone else in your family is still in college, and otherwise making sure that your information is accurate. TaxAct imported my 2014 return without flaw, including holdover losses from last year and educational information related to children in college, all of which was pulled off my prior year’s tax forms. At minimum this feature saved me 30 minutes of manual data entry, if not more. 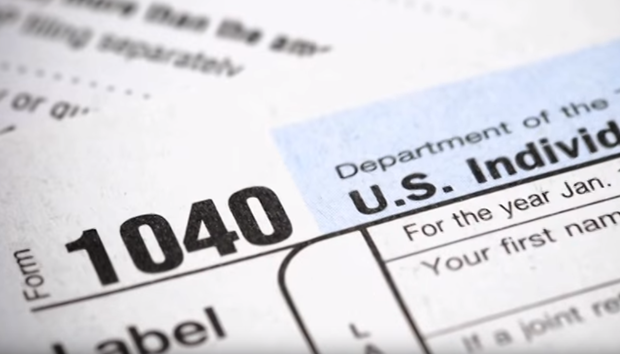 If you’ve received a K-1 from a corporation you own and you completed your corporate taxes using TaxAct’s 1120 return, you can import that K-1 data from your business return directly into TaxAct’s 1040. 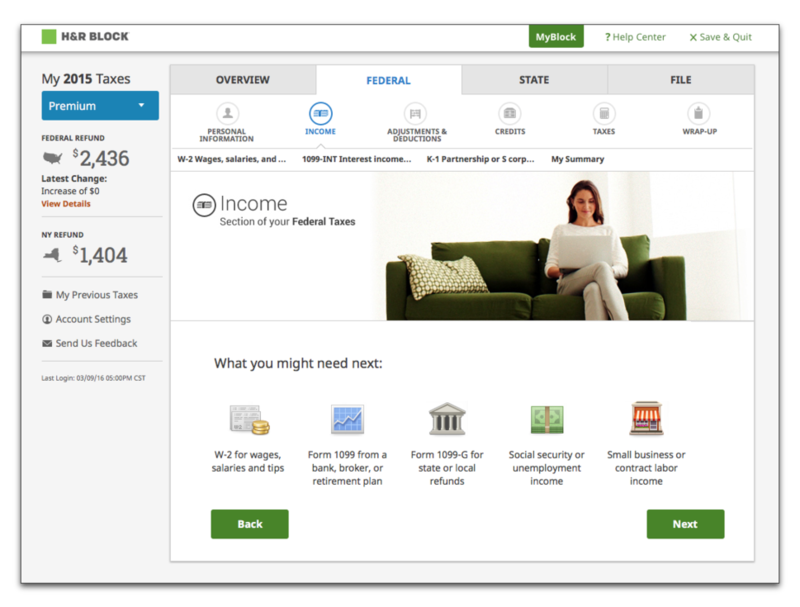 Which is, yet again, an added benefit of the app and highlights the fact that, unlike TurboTax and H&R Block’s tax offerings, TaxAct can handle all your tax needs. Once you complete the interview process, you review your file, verify that all your information has been entered correctly, pay the piper and file. All really quite simple. TurboTax ($0 to $105 plus $40 for state taxes) has long been the king of the tax prep hill, with apps that run on all your devices and, if you’re like most people who prepare their taxes at home, you’ve probably used some version of their software to file your taxes in the past. Which is why I find it odd that, for me, TurboTax provided the most frustrating experience. This frustration arose mostly from the app’s inability to automatically enter any kind of information, whether you’ve used previous versions of the app or not. While TaxAct allows you to import data from a PDF of last year’s tax returns, TurboTax won’t let you import anything from anywhere. So, even though I used the App Store version of TurboTax on my Mac last year, I couldn’t use that as a starting point for this year’s return, which meant that I had to manually enter all of my personal data from scratch. What’s odd about this is that the desktop version of the app does let you import data from last year’s return. But, as anyone who has ever used Intuit applications knows, this kind of inconsistency across platforms is par for the course. 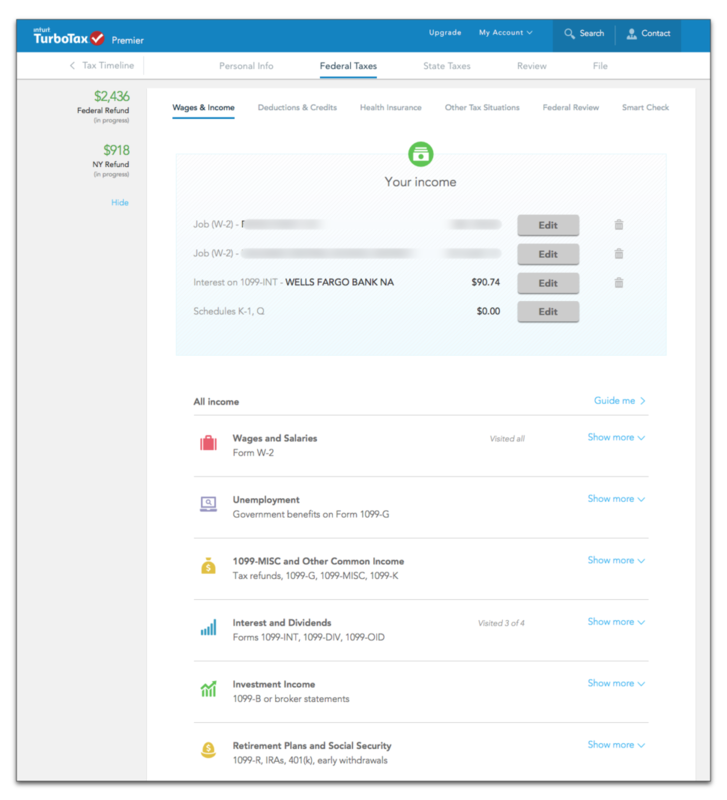 While TurboTax wasn’t great at importing personal data it does offer options for importing interest income and mortgage interest data directly from your bank. This requires that you have login information for your bank’s website, but once you provide that information TurboTax automatically imports and applies it to the proper tax documents. This isn’t a feature offered by either of the other tax apps. The TurboTax interview process is straightforward and consistent across all the Intuit tax applications, with a side benefit if you use an iOS device: Both TurboTax for iOS and the Web app use the same data, so you can start on the Web and finish on your iOS device. I have one complaint about the H&R Block ($0 to $35 plus $10 to $37 for state taxes) tax app that has nothing to do with the way the app works: It’s just not obvious how much you’re going to have to pay to file taxes before you start using the app. The H&R Block site displays comparison information indicating that it is by far the least expensive of these three apps. But as soon as you start preparing your return, it’s clear that the $10 fee displayed in the “comparison” on their splash page is what you pay when filing basic federal and state returns. As soon as your tax situation gets mildy complicated you’ll need to upgrade to a more expensive version. And $10 for a basic return is actually more expensive than either TurboTax or TaxAct, both of which are free for state and federal filings. That said, unlike the other two, H&R Block offers free audit representation and lets you transfer your return from the online app to a local H&R Block office if you want a more personal experience than the Web can offer. As was the case with TurboTax, H&R Block offers no options for importing data from a prior year’s tax return, whether that return is in PDF or H&R Block’s desktop app format. You’ll be entering all your basic data by hand if you’re using this app for the first time. While there’s no difference in the questions you’re asked in any of these apps, H&R Block offers an interface that I think is the best of the three. The text is clear, the color scheme is easy on the eyes, and everything is sized in such a way that your eyes aren’t searching edge-to-edge in the browser window and you aren’t continuously scrolling up and down to find what you need. I mentioned at the beginning of this review that I was bowled over by TaxAct: it offers the most options for filing taxes, including corporation taxes. That fact alone marks it as a standout, because the only way to file corporate taxes using a Mac is to purchase the Windows version of TurboTax for business and run it in a virtual machine or Bootcamp. There isn’t another offering on the Web for filing your business taxes, period. When it comes to filing personal taxes, in terms of questions asked and the ease and confidence with which you’re able to file them, there is no substantial difference between any of these apps. They will all walk you though the process with aplomb. But, TaxAct will do it with the least damage to your bottom line and the least manual data entry.